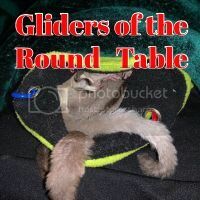 I anticipating getting my gliders next week and just had a question I hope someone can help answer. My plan was to utilize the TPG diet, but I was for some clarification on the fruits and vegetables. The recipe calls for 2 cups or 16 ounces of fruit, and 2 cups or 16 ounces of veggies. If I'm using kale for example, 2 cups full is not the equivalent of 16 ounces of kale. Which unit of measurement should I be using? 2-4 different veggies mixed, totaling 2 cups. Above is the instructions from the PetGlider website concerning the veggies. Note: Many do NOT recommend using a food processor for their fruits or veggies. Gliders take what they need from their foods and discard what they don't. With the exception of their staple, their fruits and veggies should be the size they can easily hold in their hands. I wouldn't finely chop the fruits and veggies. I would weigh out the fruits and vegetables. I also woudln't use the TPG diet because of the vitamins. You are to sprinkle vitamins on, the first glider to the food dish is going to get to many vitamins and the last one to the food dish isn't going to get enough. Since 1 cup is 8 oz, 2 cups would be 16 oz. You state the 2 full cups is not the equivalent of 16 oz... I don't follow how you've come to that conclusion. The logic is that 2 measuring cups full of kale would not be the equivalent of 16 ounces. It ended up being easier to just buy a scale. 16 ounces by volume is not the same thing as 16 ounces by weight so I don't see where the scale comes in unless you know how many ounces (by weight) is equivalent to 16 ounces (by volume) of finely chopped or processed kale (or other leafy vegetable). The issue should be that if you don't chop it finely but just cram the leafy veg into a measuring cup, a significant volume is air rather than veg so you're really not following the recipe. That was initially my question regarding the recipe. Since one cup by volume can be very different from one cup by weight. I bought the scale to measure things by weight (2 cups = 16 ounces). I may be wrong since it has been a while, but TPG diet instructions indicated by volume back when I purchased my quirky quartet, not by weight. That would be backed up by the statement of 2 cups/16oz since otherwise, it would be comparing apples to oranges (liquid-volume-based versus dry-weight-based). Now, something may have changed, but that is what I'd noted back then as it was similar to the diet I went with at the beginning. PS: 1 cup is never (in modern times) a proper weight measurement. Again, apples & oranges. I have no experience with the TPG diet, I feed Critterlove. With Critterlove, when you make the salads you weigh everything. Using weight is certainly more accurate when measuring flour for baking or when dealing with known weight equivalents but you're going to need to weigh out 2 cups of finely chopped kale to see what weight you want since the recipe you're following is measuring by volume. Sorry I wasn't very clear. I didn't think cups was a very accurate way of measuring, that's why I bought a scale to use instead. 1 cup = 8 fluid ounces, so when the recipe calls for 2 cups/16 ounces, I weigh out 16 ounces instead of trying to measure by cup since there would be too much variance depending on how finely chopped things are. Remember the TPG instructions say that fresh or frozen may be used. IF you use frozen then the weight is given on the bag. The list above are suggestions for some of the favorites they have found over time. They are not mandatory for the diet. Let me start with an example that has far less variance since there isn't any chopping involved: water. If a recipe calls for 16oz of water by volume, but you used 16oz of water by weight, you wouldn't have enough water. 16 fl. oz of water actually weighs a touch under 18 oz. (Again, using US standards.) In terms of volume, that's almost a quarter of a cup of water difference. My point is, doing it by weight isn't following the recipe. The two types of measurements are not compatible and will not maintain the ratio intended to offer a healthy, balanced diet by its creator. You cannot simply say that since it calls for 16oz by volume that it equates to 16oz by weight. If you're worried about how finally chopped something needs to be, TPG has a video on their YouTube channel showing how their diet should be prepared. It should give you a good idea of what you're looking for in terms of the size to measure. IF everything is cut about the same coarse- or fine-ness, then the correct proportions are maintained. There is nothing stopping you from going by weight, just know the choice you're making: You aren't serving TPG diet, you've made your own that is generally based on theirs. Yeah but that's your problem. 16 ounces by volume is not 16 ounces by weight unless you get very very lucky with the material density (and no leafy vegetable I know weighs 1 ounce for 1 fluid ounce). Mass is not the same as volume even if the measures have the same name. Let me put it this way: 16 fluid ounces is 2 cups is 1 pint or 1/2 quart -- so just under 1/2 liter. 16 ounces by weight is 1 pound which is 0.455 kg. How much do 2 cups weigh? If you want to be that exact, chop 2 cups (16 fluid ounces) of kale (or whatever) as finely as TPG shows then weigh that. THAT is your target weight, not necessarily 16 ounces. It appears this topic has become more of an argument about which is the proper/best way to weigh veggies, especially kale, than it is about the TPG diet itself. There is enough information within this thread for anyone to be able to figure it out. If not, then we have a tried and true saying here ... When in doubt, leave it out. There is no reason to continue to argue this point. I would prefer not to have to lock this thread.